A family-owned and operated business for over 25 years, Blinds & Drapery Showroom provides the absolute best in window coverings, custom draperies & soft goods, and interior decorating & design services. Owner, Bob Yocum, attributes his success to an unwavering committment to customer service as well an ability to provide products of the highest quality and craftsmanship. 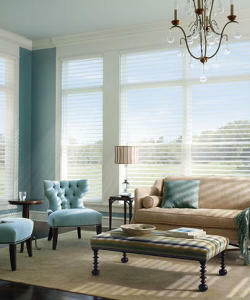 Blinds & Drapery Showroom is a Hunter Douglas Gallery Dealer and offers an extensive line of designer fabrics, trim, and hardware to complete any decor with style. A team of experts stands ready to assist you in choosing blinds, shades, shutters, and window treatments – from materials to installation. We’ve got you covered!